Deputy Kevin 'Boxer' Moran TD takes the specialised rough mower for a test drive at Athlone Golf Club. He is pictured with Lady Captain Margaret Egan, Course Manager, Denis Earley, Kevin Newcomen and Micheal O'Faolain. 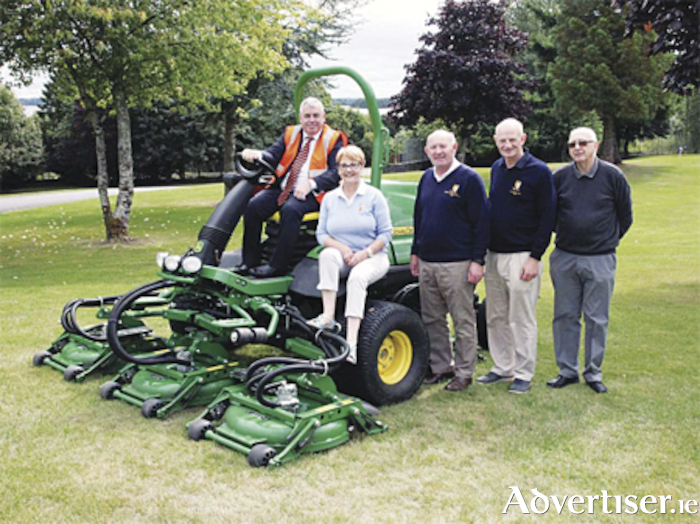 Funding under the Sports Capital Programme has enable the purchase of a special rough mower at Athlone Golf Club. Lady Captain Margaret Egan stated that the club's existing machinery had outlived its usefulness and the purchase of the new mower would not have been possible without the support of the Sports Capital Programme which is administered by the Department of Transport Tourism and Sport. Minister for State Kevin (Boxer ) Moran acknowledged that, "Midlands clubs received extensive support under the 2017 Sports Capital Programme adding his belief that "programmes such as the 'Sports Capital Programme' and the 'Irelands Hidden Heartlands' initiative are fundamental to the greater development of our Midland Region."